Will a shrinking Navy mean shrinking US influence abroad? In the following year the collapse of the Soviet Union, the U.S. combat fleet numbered 466 ships. By 2001, it had shrunk to 316. The decline continued throughout George W. Bush’s two terms to the current level of 285 ships. Since February 2006 the Navy has consistently maintained that it needs at least 313 ships to perform the missions assigned to it. As manpower diminished, the interval at which the Navy conducted burdensome but effective individual ship inspections rose from 3.6 to 5 years. The failure rate recorded by these inspections also increased over ten years beginning in the mid-1990s, from 3.5 percent to almost 14 percent. Insufficient maintenance aboard ships produces the same result as it does in cars: It shortens their useful life. Baslisle predicted that crew shortages and associated problems with the material condition of destroyers will shorten their service lives from the expected thirty and hoped-for forty years to 25–27 years. Fleet levels are calculated by multiplying the number of ships built annually by their anticipated length of service. If either number falls, so does the size of the fleet. If Balisle is right, a significantly smaller fleet lies in our future. Chief of Naval Operations Admiral Gary Roughead knows there’s a problem, but the solution is elusive. The Navy needs another 6,500 personnel to supply current deficiencies ashore and at sea. Evaporating resources sparked the search for efficiency; efficiencies contorted the fleet, and now the fleet needs additional resources to correct the contortions. So, like the children’s song in which repairing a hole in the bucket turns out after a long series of needed fixes to be impossible because there’s a hole in the bucket, the Navy’s options are circumscribed by the budget, existing manpower commitments and the upwardly spiraling cost of added personnel. Thus, a smaller US navy means smaller US influence outside the continental 48 states - like in the Persian Gulf or the Western Pacific. And where there's no strong patrolling naval presence, things like piracy emerge. At the same time of the US naval decline, Chinese naval power has sharply risen. 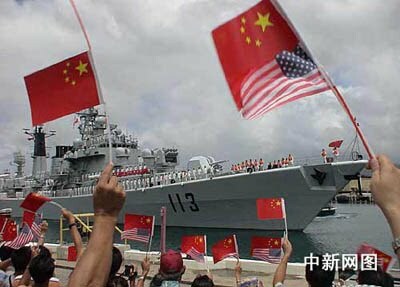 The Chinese military is seeking to project naval power well beyond the Chinese coast, from the oil ports of the Middle East to the shipping lanes of the Pacific, where the United States Navy has long reigned as the dominant force, military officials and analysts say. It's worth pointing out that during the 15th century, the Chinese Empire had the largest, most powerful navy in the world, led by explorer and commander, Zheng He. But after a dynasty change led to centuries of isolationism, the empire eventually learned the hard way about the perils of a poorly-operating navy to national security. Many historians still hold the ancient authorities that neglected China's maritime potential responsible for the "shameful" rule over China by western powers in modern times, claiming the failure to maintain its first modernized navy cost China dearly. The Imperial Beiyang Fleet, established during the Qing Dynasty (1644-1911), was said to be the "best navy in Asia" and the "eighth best in the world" in the late 1880s. But it was destroyed ships from Japan within six hours, partly because the Qing leaders were careless with the country's maritime security. After the defeat, the commander even ordered the destruction of the fleet's 7,100-ton, flagship Dingyuan to prevent it being seized by the enemy. The armored turret ship was the biggest battleship in East Asia at that time and was still the largest combat vessel in China's recent naval history. As a consequence of the defeat, China was forced to concede Taiwan to Japan and did not retrieve it until after World War II. Hence, the investment in naval security for Chinese interests. With this in mind, the PLA has offered consistent defense budgets to upgrade weapons and technologies in recent years, added Senior Colonel Li Jie, a researcher at the navy's Military Academy. The bold move to send fleets to protect Chinese merchant vessels against Somali pirates last December has also caught the attention of the nation. It was the first overseas military combat mission for the navy since Zheng He's six centuries ago. Netizens praised the efforts to protect national interests, even though the mission zone near Somalia is 5,000 nautical miles from China's shores. Of course, China's neighbors have noticed the country's new naval posturing - particularly the millions of dollars China has invested in their infrastructure for the sake of Chinese maritime trade and security. Flush with over $2.5 trillion foreign exchange reserves, China has invested in South Asian and African littoral states so as to secure its sea lanes of commerce and to avoid sending its oil ships through the straits of Malacca, Sunda and Lombok. In pursuance of its “strings of pearls policy”, China not only gifted and built the Gwadar Port for Pakistan (which will unload West Asia oil, to be moved by Chinese-gifted roads and pipelines to China through the proposed Karakoram highway), but is now building ports in three countries which are India’s neighbours. In Sri Lanka the Chinese are funding and building the $9 billion Hambantota seaport (three times larger than Colombo) and the nearby Mattala International Airport, both to be ready by 2015. In Bangladesh the Chinese are funding and building two deep water terminals at Chittagong and a brand new seaport nearby. Both these terminals and the new port will be linked by road and oil pipelines to Kunming in China, and will pass through Burma. Similarly Sittwe deep water port in Burma is being funded and built by China, and will also be connected to Kunming by road and oil pipelines. China has also invested in similar facilities in Tanzania and Angola. So in the very near future, PLA (People's Liberation Army) naval ships will skim around the Pacific and Indian Oceans to back up China's commercial and security interests, and have plenty of "safe zones" to dock all around the world. Certainly, the United States, India, Australia, and Japan will still have active navies in the area - but China has planted the seeds for regional dominance, and international tensions will only increase from here. Guess it must be a great time to be in the Chinese shipbuilding industry.